The Economic Ministers of the 53 member states of the Asia-Europe Meeting (ASEM) are convening in Seoul from September 21 to 22, 2017. Given the rising protectionism worldwide and especially U.S. president Donald Trump’s nationalistic economic policy, we argue that this meeting is an opportunity to signal good economic cooperation beetween Asia and Europe. Traditionally, the United States has taken center stage in EU economic relations. Since the Trump administration took office however, the future of the transatlantic axis is uncertain. Furthermore, Brexit means that the European Union is facing an at least partial economic disintegration. The EU’s external economic policy therefore needs reorientation. Asia—the world’s most dynamic growth region—should play a central role in this regard. Today, the four largest Asian national economies—China, Japan, India, and South Korea—already account for approximately one-fourth of global GDP. So does the United States, thus currently being the dominant global economic power. However, the Asia-Pacific region is expected to have high economic growth in the future, while the growth rates in industrial countries are forecast to stagnate or decline. For this reason, the EU’s Trade and Investment Strategy published in 2015 also calls for the strengthening of the EU’s “presence in the Asia-Pacific region”. The rising protectionism worldwide and, more specifically, the political antics of U.S. President Donald Trump, have given strong momentum to what some observers have already called “Europe’s Asia Pivot”. Furthermore, Brexit means that the European Union is facing an at least partial economic disintegration. Against this backdrop it is all the more important to find new partners and to strengthen or reorient relations with old partners, Asia being one of them. 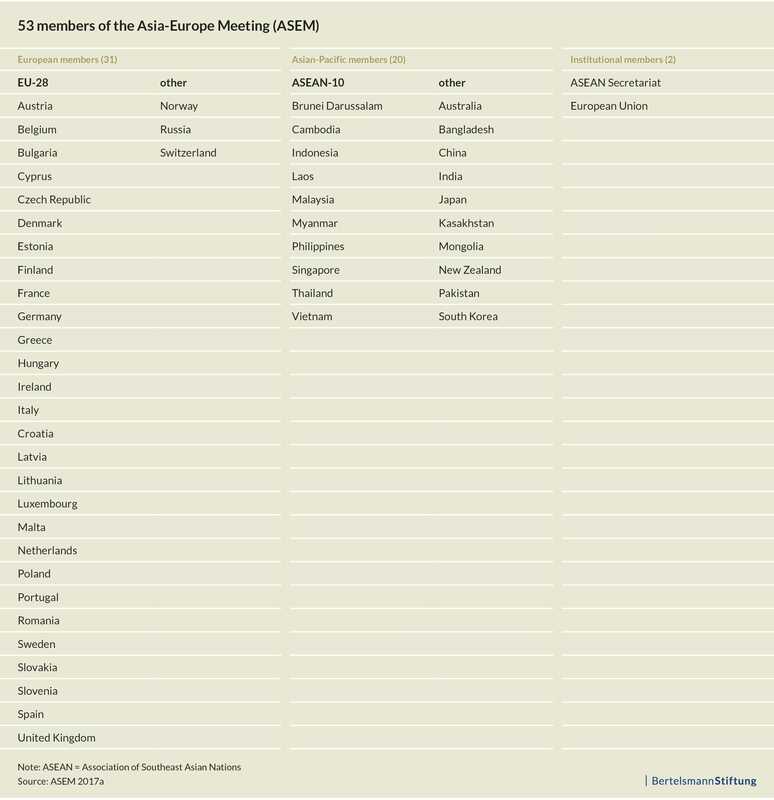 The Asia-Europe Meeting (ASEM) with currently 53 members already gives European-Asian relations an institution that would lend itself to this purpose, since the promotion of economic cooperation is an important pillar in the ASEM process. In the future, Asia and Europe could make greater use of this platform in order to further expand the framework conditions for European-Asian trade and investment relations. 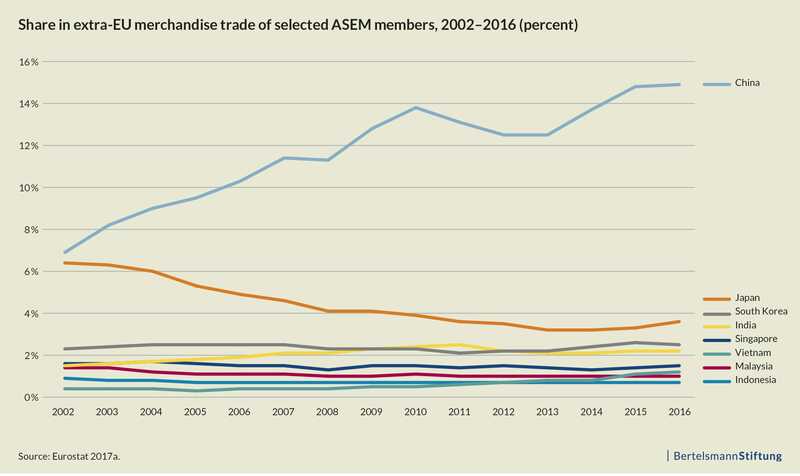 The 18 Asian members of the ASEM already take on major importance in so-called extra-EU trade, that is, exchange of goods between the EU and the rest of the world: In 2016, they stood for approximately 31 percent of extra-EU trade. China as the region’s economic heavyweight accounts for half of this (14.7 percent). Nevertheless, the United States continues to be the EU’s most important extra-EU trading partner. In extra-EU imports, however, China takes first place over the United States. Among the top 10 extra-EU trading partners in 2016, there were three other ASEM members: Japan, South Korea, and India. It was only trade with China, however, that grew at a truly dynamic rate. Japan’s share has fallen by almost half since 2002. South Korea’s and India’s shares have stagnated at around 2.5 and percent, respectively. In contrast, Malaysia, Indonesia, and Vietnam, which are regularly cited as future economic centers in the region, have barely exceeded 1 percent in the past 15 years. Free trade agreements (FTAs) are one key to releasing the potential that the trade relations between the EU and its most significant ASEM trading partners could offer. At the present time, the EU is negotiating bilateral FTAs with a number of Asian countries. Negotiations on bilateral FTAs have already been concluded with Singapore and Vietnam, although the agreements have not yet entered into force. Other negotiations, such as with Japan, have gained new momentum with U.S. President Donald Trump’s accession to office. As of to date, however, South Korea is the only Asian member of the ASEM that has an FTA with the EU that has entered into force. The transatlantic relations are dominant in foreign direct investment (FDI) between the EU and non-EU member states (extra-EU FDI), too: the United States accounts for 37.1 percent of the EU’s outward FDI stock and even 41.4 percent of the EU’s inward FDI stock. 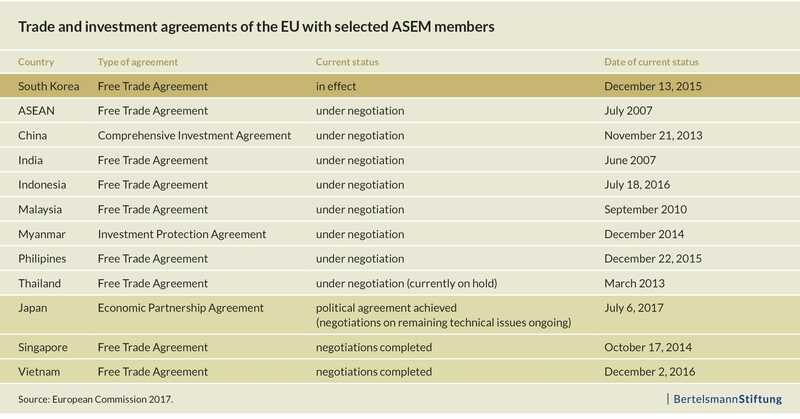 In contrast to extra-EU trade, the Asian members of the ASEM play a rather subordinate role here: their share accounts for 9.5 percent and 5.3 percent, respectively. This shows that the EU has invested significantly more in these countries than vice versa. At least part of the EU’s trade deficit with the Asian members of the ASEM is attributable to this: European companies have set up subsidiaries in Asian countries through which they import cost-efficient intermediate and final goods into the EU and from there—possibly processed further—export to other regions of the world. It is therefore not surprising that China, as the “factory of the world,” currently is the EU’s most important FDI location in Asia. 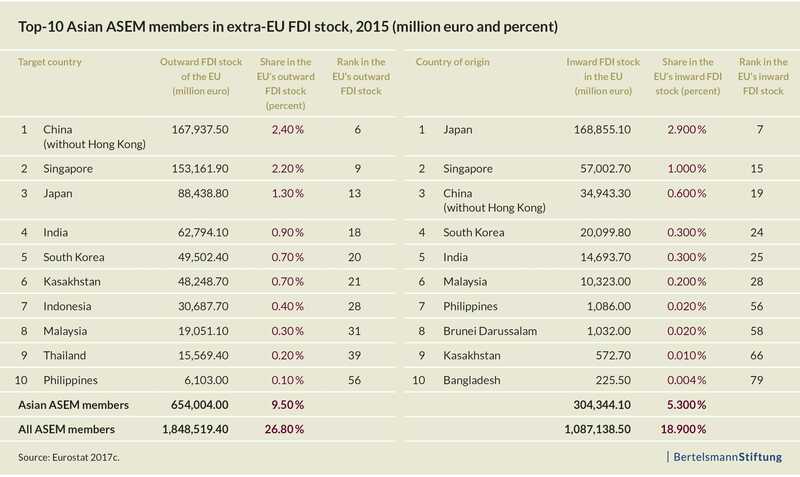 As for the FDI stock the Asian ASEM members hold in the EU, Japan is the only country whose share in the EU’s inward FDI stock is significantly above one percent. The other countries are in some cases far below that—even though most of them have greatly expanded their shares in the last 15 years. China’s FDI stock in the EU has experienced particularly dynamic growth, increasing by a factor of nearly 60, from 605 million euros (0.05 percent of the EU’s inward FDI stock) in 2001 to approximately 35 billion euros in 2015. At present China still occupies a central place in economic relations between the EU and the Asian members of the ASEM. However, since 2012, China’s growth rates have slowed significantly and will continue to do so in the future. According to our projections based on Oxford Economics, China’s economic growth through 2030 could even decline to an annual rate of two percent. 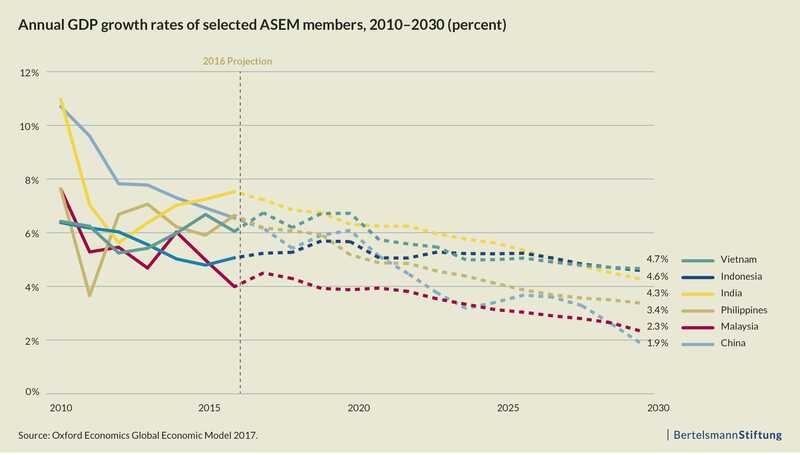 The growth rates of the other Asian members of the ASEM will decrease over the long term, too; the focus will shift markedly in the direction of Indonesia and Vietnam, which can still expect growth rates of around 4.6 percent in 2030. In India as well, significantly more dynamic growth than in China is forecast, totaling roughly 4.2 percent in 2030. In the future, China will nevertheless remain a key economic partner for the EU. However, it is already foreseeable at this stage that China will increasingly become more of a competitor and that complementarity in trade relations will decline. Against the backdrop of uncertainty in transatlantic relations and increasing competition from China, it is crucial for the EU to create good framework conditions for the relations not only with Asia’s future economic centers, but also with the region as a whole. The uncertain future of the transatlantic trade bloc means that the EU should reorient its trade policy. The Asia-Pacific region with its dynamic growth prospects should be a major focus in this regard. One key element in this process will be the establishment of a solid foundation for European-Asian economic relations in the long run. In fact there is already an idea of what such a formal framework, based on the ASEM process, might look like: The Free Trade Area of Asia and Europe (FTAAE) could bring together all 53 ASEM members into a vast free-trade zone. It would represent around 62 percent of the world’s population, 57 percent of global GDP, and 66 percent of global trade. The FTAs that already exist and are still being negotiated between the member states could be included in the process and clear the way for this. The Economic Ministers of the 53 ASEM countries are meeting in Seoul from September 21 to 22, 2017. At the preliminary meetings, a central topic was the new momentum that the ASEM has gained due to the changes in the international framework conditions. Even though an FTAAE still appears to be unrealistic at this juncture, it could be helpful for Europe and Asia to enhance and openly discuss this kind of visions for shaping mutual relations. The Asia-Europe Meeting lends itself as an appropriate platform for this purpose.